“I’m too young to be collecting dishes!” Yes, these famous last words came out of my mouth shortly after moving to Germany. I’d see the stuff everywhere – decorating the walls at a friend’s house, overflowing with food at a potluck gathering, or being sold by at a booth outside the post store. And don’t forget each and every shopping bazaar – the table surrounded by a frenzy of ladies was sure to have a well-stocked selection. I resisted its tempting allure for the first couple of years and believe it or not, my husband caved first. We were at a bazaar and I was engrossed in a pile of carved wooden boxes as my husband explored the pottery table nearby. Then, he uttered those nine little words that he’s probably regretted ever since, “what do you think about buying some Polish Pottery?” It was all over. We went home with five different pieces that afternoon but it was just the beginning - countless patterns, every color imaginable, and plenty of shapes and sizes – it turned out that not only was I not too young, I needed it all. I took my first Polish Pottery shopping trip a few months later with the USO – you know, the one that you spend an insane 30 hours in a state of pottery-induced, it-doesn’t-matter-how-much-I-spend euphoria. Everyone loads on a big touring bus at 9pm on a Friday night and at around 4:30am, the shopping madness begins. Shop owners know when the buses arrive so they pull themselves out of bed early to make that extra money. Each shop is a race – not only against your new friends on your bus but against that next tour bus you HAVE to stay in front of. Dinner plates, dessert plates, coffee cups and saucers, serving dishes, baking dishes, tea sets, salt and pepper shakers – anything you need for the kitchen or dining room. 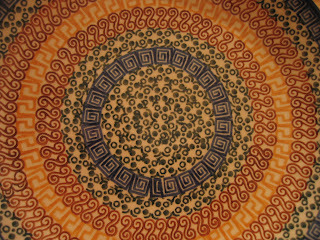 Recently, I’ve seen pottery items that you can use outside the kitchen such as wall decorations, planters, and some rude ones I won’t mention… Some people have their one, beloved pattern while others, such as myself, mix and match for an eclectic look (they are also easier to replace if, heaven forbid, something breaks). Stop only for a short lunch of goulash to keep your energy level up and keep going. The trip is also a learning experience, not just a chance to lose control. When looking at the pottery, try and purchase only ‘category 1’ items. The category indicates level of flaws so the higher the better. Category 1 pottery is oven safe for up to 425 degrees F and dishwasher safe (although I don’t trust the dishwasher…I don’t even trust my husband to hand wash it…if you saw my collection of crystal glasses, you’d understand). Category 2 is oven safe for up to 325 degrees F and ‘probably’ dishwasher safe. Category 3 and higher should only be used for serving. Also, if you find the label ‘unikat’ on the bottom, the pattern is original to the store you purchased it from. The best brand to purchase is the one that has the little castle inside the pitcher. Honestly, I never learned the name, just the trademark symbol. Finally, the Golden Rule of Polish Pottery Shopping in Poland is: if you find a piece/pattern you like, purchase it there! You probably won’t be able to find the exact same piece anywhere else so if you can stand the idea of potentially losing a couple dollars vs. getting that special piece, do it! At about 5pm, it’s time to head back. The bus is crammed, the luggage spaces underneath the bus are as full as they can be, and every bump in the road produces a worried ‘gasp’ from the exhausted shoppers. The Stuttgart USO automatically gives everyone two seats and by this time, you are saying a silent blessing for that ingenious perk. You get back to post around the wee hours of 3am and barely have the energy to conjure up that little white lie to your spouse on how much you *actually* spent. Your body is screaming with a mixture of exhaustion and cramps from the bus but it was worth it! Especially when you move back to the states - watch QVC and you’ll see what I mean. The other day, those silly, smiling ladies were selling one little dessert plate for $42! On a final note, I recommend going with a group to Poland as opposed to just you and the family. Bus trips, although tight and you have to concede to the groups schedule, it’s better than getting your car stolen (which happens quite a bit – and how easy do you think it will be to track it in a former Eastern Block country??). I’ve heard so many of these car jacking stories – one woman brought her husband along to watch the car…he did – watched it get driven right out of the parking lot. I had a friend tell me that she’ll only drive her car to Poland if her husband goes AND he drives the car in circles in the parking lot while she shops. I’ve also seen small groups, whether friends or organized by a resourceful military spouse, hire a chartered bus and driver. Each pitches in for a portion of the bill so not only are they leaving the driving to someone else, they are buying themselves peace of mind. Have fun and remember, you are contributing to the Polish economy! www.uso.com – Those affiliated with the military have this resource. Check your local USO’s page for a schedule of tours. www.enjoytours.com – this company does plenty of trips to great destinations, but they don’t have that ‘2-seats-per-person’ policy that the USO does. Over the last couple of months, I’ve been able to do some magazine, online, and radio interviews and each one has sparked a flow of wonderful emails from people asking how I got into traveling. So this week, I want to share some of my resources that I use almost every time I start planning a trip – short or extended. Like I say in most of my interviews, I was hesitant about traveling at first. New country, new culture, new language – it’s scary to get out there at first! I’m actually experiencing that right now as I adjust to South Carolina (the accent feels like a different language sometimes and I’m fighting to keep the word “ya’ll” out of my vocabulary :) Some people can get out there and just drive around and find places…I can’t (that, and I don’t want to waste that expensive stuff I have to pump into my car every couple of days). Shortly after we moved overseas, my in-laws sent me my first Rick Steves book. Seven years later, the pages are dog-eared and there’s a bit of sticky gelato on the spine but it’s still a fantastic book. Steves has been a European traveler for decades and despite those khaki shorts (which can be downright goofy sometimes), the man is a travel genius. Honestly, I don’t start planning a major trip without looking up what he’s written on the destination already. Why recreate the wheel when Steves has already done so – the wheel, the cart, the horse, AND the little guy that sits up front and yells, “let’s go!” I’ve got several of his books (and I’m actually waiting for a new one, too – his office is sending me one for talking on his radio show) and every single one of them have been worth what I paid. Another book I use just as religiously as Steves’ collection when I stay within Germany is called “Time to Travel, Travel in Time: to Germany’s finest stately homes, gardens, castles, abbeys and Roman remains”. This one’s probably my all-time favorite because it includes not only information on each destination, such as a brief history, opening times, and admission costs, the photography is absolutely stunning. Large, full color pages prevent even the most reluctant traveler from exclaiming, “there’s nothing to do here” :) It’s published in Germany and sold at many of the castles featured in the book; I was able to locate and purchase it online (ISBN: 3-7954-1411-3, published by Schnell & Steiner, 2001). There’s a companion book also published by Schnell & Steiner that you can use if you are into gardens and parks, “Pleasure Gardens, Garden Pleasures: Germany’s most beautiful historical gardens” (ISBN: 3-7954-1536-5, published in 2003). Like “Time to Travel”, it includes text, great information, and gorgeous full-color pictures of each destination. I used the books together as my husband was completely and utterly burned out on castles but he still found the gardens enjoyable. Just flipping through these books makes me ache to go back! If you are at a military base, the USO is a great tool. I’ve taken a few of their tours myself but I’m not a big fan of getting up at 3am to sit on a crowded bus. Most of the time, I’d use the USO for ideas. You can get a basic itinerary for one of their trips and then plan your own trip around that, tailoring to your individual interests and pace. I had a friend who would actually follow the USO bus in his car so he wouldn’t have to pay :) I don’t want to discourage taking a USO trip, though – they can be a lot of fun and I’ve always made new friends (even on the most uncomfortable of rides) – so please don’t write them off! In addition to tours, the USO always has tons of free information on a myriad of places in Europe. I also use plenty of budget travel options! If my destination is close enough to drive (in my mind, that’s under five hours), I throw my bags in the car and go! Anything with a driving time over five hours requires alternate transportation (I don’t like spending a majority of my time off behind the wheel). Germany’s got a fantastic train system and on the weekends, they offer a ‘Schoenes Wochenende’ ticket. For about 30 euros, you have the weekend to train as much as you want (within the confines of the state you are in, see their website for details on this and other offers at www.dbahn.de and click on ‘International Guests’ for English). Although not as reliable as the German system, Italian trains offer the comfort of leaving the driving to someone else – www.trenitalia.com (the ‘English’ button is in the top right corner). Too far to drive or train? Flying within Europe can be incredibly cheap! I love using German Wings (www.germanwings.com), HLX (www.hlx.de), and Ryan Air (www.ryanair.com). I’ve flown from Stuttgart to Pisa and return for only 30 euros! Check daily as they run 24 hour specials where one-way flights are as low as 19 cents. Watch baggage weight limits, though! Need an inexpensive hotel? I check Rick Steves books for recommendations and then search them on www.hrs.de (click ‘English). I’ve done a TON of internet searches for hotels and for the most part, I’ve found that HRS offers the best deals regardless of the country I’m checking into. Plus, you don’t have to wait to find out if the reservation has been made (plenty of other sites take your credit card and then get back with you in three days to confirm) – when you book, you know you have a reservation and receive a confirmation code immediately. Further, many of the hotels that list with HRS don’t require a credit card to book and you have up to 6pm that day to cancel if you need to. Each year, hundreds and hundreds of tourists flock to the famous Heidelberg Castle for pictures of the exquisite red ruins. Unfortunately, many of those visitors overlook the nearby Schwetzingen Castle and Gardens. Only a few minutes from its more famous cousin, Schwetzingen patiently waits to be enjoyed. With roots as far back as 1350, Castle Schwetzingen is a delicious example of baroque architecture. Electors, Princes, Counts as well as famous writers, poets, and a seven-year-old Mozart have graced the echoing hallways over its history. Delight in the details as you explore room after room in this exquisite palace - painstaking restoration work has kept this piece of the past in pristine condition. Although the castle is an experience in and of itself, some argue that the gardens hold the real pull for visitors. Symmetry is supreme, giving a balanced feeling to even a short glance out into the gardens. Meticulous organization harmonically coexists between the lush green life of nature and the stark man-made marble that is heartily sprinkled throughout the gardens. Rows of arched greenery hide the visitor and if for even a moment, give total solitude from the outside world. Pan hides among the living maze, perched atop a large boulder and playing a silent tune for a forest audience. Stop and listen, hoping for a note or two from the lone performer. The Temple of Apollo boasts from a small hill; a few well-angled sunbeams make its fence line full of golden suns glow. Travel to exotic lands by passing the marble lions and perfectly manicured trees which silently guard the pathway to the mosque. Imagine the scent of incense burning while listening to the low lull of a mid-eastern melody. Continue on to discover the Asian bridge and the temple ruins before losing yourself again in the labyrinth of foliage. Maulbronn Monastery humbly hails as the most well-preserved medieval complex of its kind north of the Alps. Situated in a little German village of the same name, this beautiful reminder of the past welcomes visitors to explore its intricacies once cut off from the public’s eye. Constructed between the 12th and the 14th centuries in Gothic and Romanesque styles, the monastery complex is made up of several quaint half-timbered structures including the staff’s quarters, an infirmary, mill, guardhouse, and stables. Easily the most impressive is the main monastery building which houses the church and living areas for the monks. The diamond vaults of the gothic ceiling lead the eye from the entrance of the church upwards and forward to the alter. High stained glass windows provide an appropriate backdrop for the centered crucifix and hidden choir area. The dark, carved wooden stalls for the singers have stood since the 1400’s and ache for another service. Outside this sanctuary, the arched ceilings of the cloisters seem to run forever as the entering sunlight makes the soft sandstone glow. 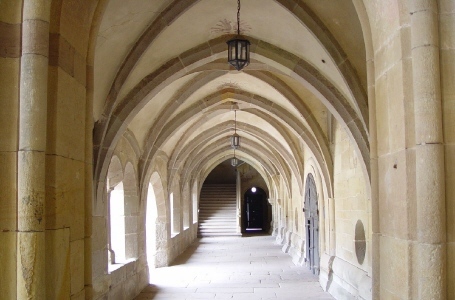 These hallways quietly echo with the ancient chants of the monks buried underfoot. Only the Fountain House (sometimes called Well House) interrupts the meditating in the passageways – its three-tiered basins provide a quiet, trickling background music. The subtle, yet intricately detailed paintings worked into the ceiling architecture whisper from such areas as the church, Refectory, Chapterhouse, Library, and Locutory. It makes one wonder if the monks looked up to heaven because they were worshipping or simply admiring the handsome artwork above. Aged and pure, Maulbronn is not widely known to the typical European tourist – making it more attractive to visit. Instead of crowds and lines, the monastery offers an escape from the outside world with one step inside its walled gates. Be the lone soul in the breezy, hollow corridors that bounce a deafening reverberation of your footsteps. Profoundly reflect on the years and the world events that passed by unnoticed to the reverent monks since the monastery’s completion. Throw your arms around an almost-thousand-year-old pillar and press your cheek up against the cold stone. Maulbronn Monastery hangs on to a forgotten time with a white-knuckled grip and is truly a unique experience.